​​Grant Park AKA 'Chicago's Front Lawn' is located in Chicago's central business district, the park's most notable features are Millennium Park | Buckingham Fountain | The Art Institute of Chicago | Museum Campus . The park contains performance venues, gardens, art work, sporting, and harbor facilities. It hosts public gatherings and several large annual events throughout the year.​ So much to do....so little time! Attractions around every corner---art, music, history, architecture--the list goes on! You'll find fun and interesting things to do every day of the year. Millennium Park is pretty impressive, but when you actually understand the story behind this amazing park it become so much more interesting! Millennium Park is Chicago's pride and joy, and it should be with all the money that was and still is poured in to it. To think of all the people who made it possible and how much they've impacted tourism in Chicago with this park alone is pretty remarkable! We love our city! Museum Campus is a 57-acre park in Chicago that sits alongside Lake Michigan and encompasses three of the city's most notable attractions: the Adler Planetarium, The Shedd Aquarium and the Field Museum of Natural History. The center-piece of Grant Park. Kate Sturges Buckingham, was an art collector and philanthropist. She collected medieval sculpture, tapestries, and decorative arts. She is best known for her gifts to the city of Chicago, specifically the Buckingham Fountain in Grant Park, a statue honoring Alexander Hamilton in Lincoln Park, and her family's art collection to the Art Institute of Chicago. Born to a wealthy family and heir to the family grain elevator fortune. This gave her the means to continue collecting art, and to fund public arts projects. 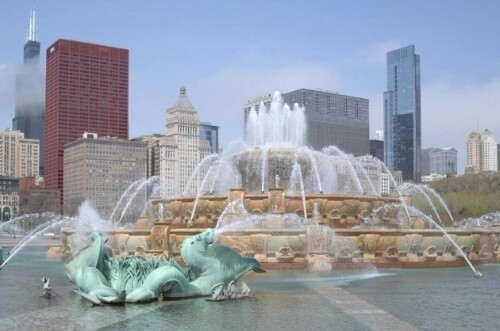 The fountain itself represents Lake Michigan, with four sets of sea horses (two per set) symbolizing the four states—Illinois, Wisconsin, Michigan and Indiana—that border the lake. The fountain was designed by beaux arts English architect Edward H. Bennett. Bennett was well known for his design work and co-authorship of the 1909 Plan of Chicago. While Burnham raised money and visibility for the Chicago Plan, Bennett created the actual layouts and drawings which are so well known today. The statues were created by the French sculptor Marcel F. Loyau. The design of the fountain was inspired by the Bassin de Latone and modeled after Latona Fountain at Versailles. 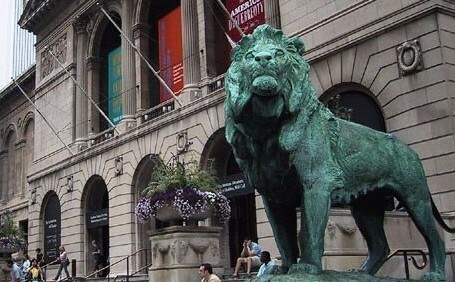 The Art Institute of Chicago collects, preserves, and interprets works of art of the highest quality, representing the world’s diverse artistic traditions---internationally recognized as the leading fine-arts institutions in the United States. Art Institutes Modern Art Wing is considered one of the finest and most comprehensive in the world, the Art Institute's extraordinary collection of modern art includes nearly 1,000 works by artists from Europe and the Americas.